The other day I made some homemade pesto for the first time ever. 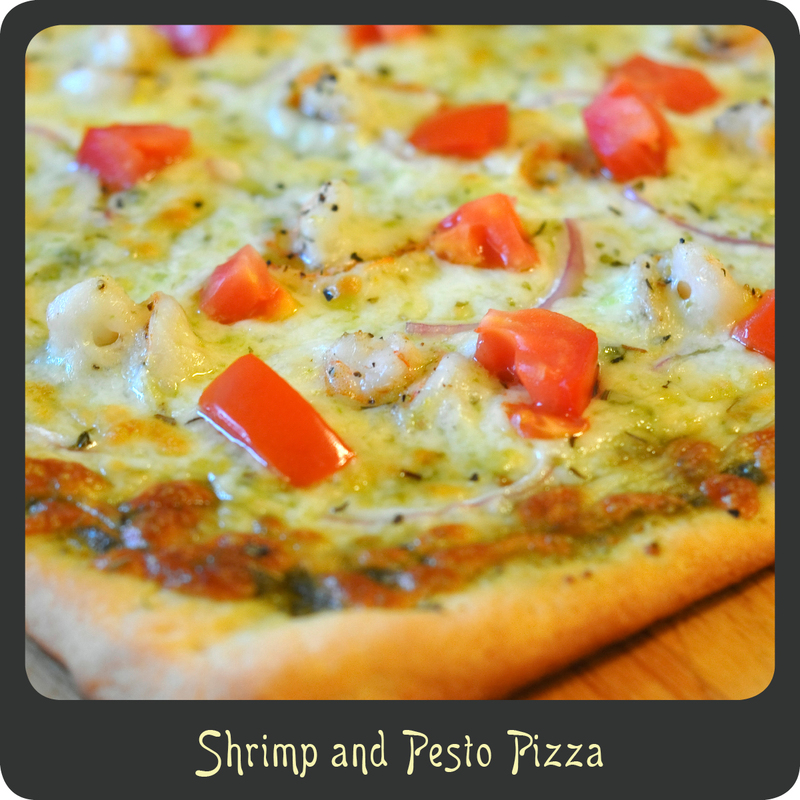 I really wanted to create an awesome pizza combination to use my pesto on and this is what I came up with, a delicious shrimp and pesto pizza. Yes it is a complete departure from your typical pizza and yet it was ahhh-mazing! It was really light and refreshing. The shrimp were cooked to perfection and went so well with the pesto. I didn’t go too crazy with the toppings. I just wanted to keep it pretty simple and it really allowed all the flavors to come through. We love making homemade pizzas during the week because they are incredibly quick and easy and usually cheaper than ordering one from your local pizza parlor. This may have just been my best homemade pizza to date! Note: If you don’t have the time to make my homemade pesto recipe, I recommend getting the store bought kind and stirring in a splash of lemon juice. The hint of lemon really sets off the shrimp. Slice your shrimp in half lengthwise. This will help them to cook quicker and will be easier to eat. Season the shrimp with slat and lemon pepper and set aside. Unroll the pizza dough onto a greased cookie sheet. Starting at the center press, the dough out until it is your desired thickness. Spread an even layer of the pesto onto your dough. Top with cheese, onions, shrimp, and tomatoes. Dust your pizza with Italian seasoning. Bake in the oven for 12–14 minutes or until crust is a golden brown. Turn on the broiler for an additional 2 minutes to given the cheese some nice golden brown spots. Allow to cool for a couple of minutes before slicing.